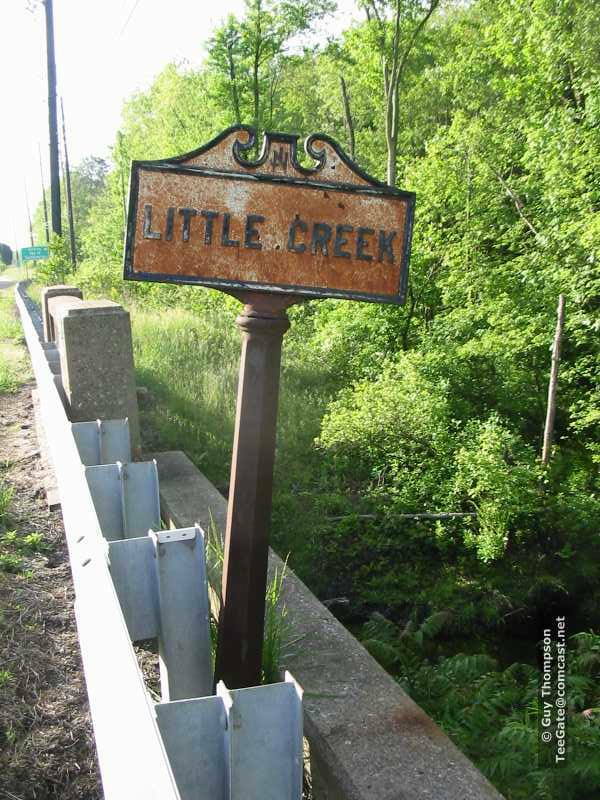 In years past the state placed signs along major highways denoting the names of the creeks, streams, and rivers that the highways passed over. Some of those signs still exist, and I have been wanting for the longest time to photograph as many as I could that I came upon. I pass two in particular all the time on Route 70, and this morning Jessica and I were quite a bit early for what we had planned to do in the pines, so I stopped and took a few quick shots of them. If you have the booklet put out by the Batsto Citizens Committee title “A Journey Through Atsion” that is for sale at Atsion and Batsto, you can view the one that was at Atsion Lake. 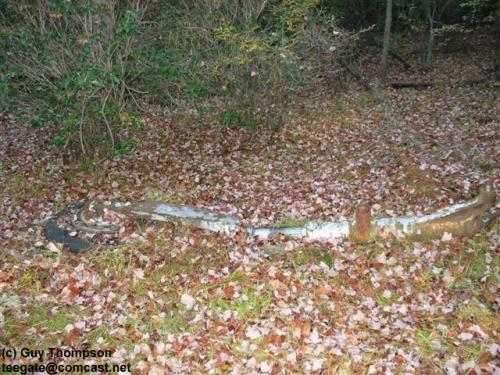 There most likely was one on each side of the road, and at one location there is. 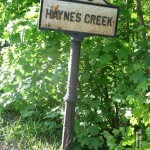 So the two photo’s with the same name on the sign are on opposite sides of the road. There was one along 70 near the Red Lion Circle that said “Bear Swamp”, but that unfortunately disappeared about a year or so ago. I am a little late getting started on this. If you know of any other locations, and want to pass that info on, I will try to stop in and get a photo. Or, post one of your own if you so desire. Sorry about the odd lighting, but it was a little after 7AM this morning when I took the photo’s. The sun was not at a very good angle. 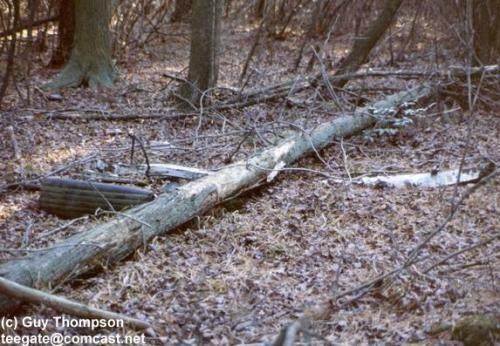 In a remote section of woods in Hammonton one can find a mile and a half long canal dug by Augustus Richards in 1877 used to divert water from the Nescochague for use in his cranberry bogs. Building canals for a cranberry bog was nothing new; however, Richards was soon to see himself in court over his actions for this particular endeavor. In 1858 Augustus Richards began inheriting property in the area that is now Richards Ave North-West of the the Pleasant Mills Church. This property totaled about 2500 acres and extended up to what was the Batsto Tract line along the Nescochague. With his various acquisitions Richards started growing cranberries, and in 1876 with the intent to irrigate the bogs he had on his property, he decided to build a canal to carry water from the Nescochague (also know as the Forge Stream) to their location. With the bogs fairly close to the river, his canal would not have to be very long, but Richards wanted it to start much further up the river making this a major undertaking. 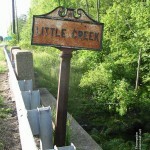 For some reason Richards was not happy with having the beginnings at the river on his property, instead, he preferred to have the canal connect to the river on a small piece of his neighbors land. His neighbor was Joseph Wharton and Richards soon contacted him asking if he could do just that. Wharton apparently was receptive of the idea, and set about getting Richards an easement for the beginnings of his canal. 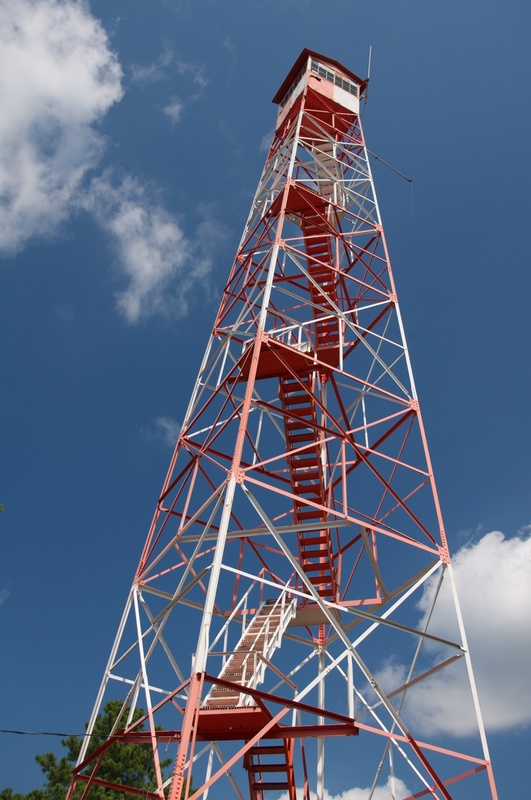 He assigned his surveyor Elisa Wright the task of making this happen, and in the days to follow Wright and Richards through a flurry of letters came up with a precise location. On May 20, 1876 the property passed to Richards hands. The easement was 40 feet wide and 230 feet long, and consisted of .2781 acres. After carefully examining the document and location in the summer of 1876, Richards proceeded digging that portion of his project. To divert the water to the canal, Richards needed to dam the Nescochague. By pounding cedar pilings across the river and dumping remains of a glass factory, stones, and brickbat, he was successful. In August of 1877 he had finalized his project, and that very same month he set in motion the diversion of the river to his bogs. Soon, the flow of water in the river below his dam was diminished, and the workers and owner of the paper mill at Pleasant Mills were alarmed. With production cut in half because of the loss of water, William Farrell, the owner of the mill, set on foot up the Nescochague to find the cause. In court papers Farrell claims that after finding the dam and asking Richards to remove it, Richards refused and later even gave speeches about his right to divert the water, keep the dam intact, and prevent any water from taking it’s natural flow down the Nescochague. With Richards refusing to remove the dam, Farrell elected to take him to court. To prepare for the case, both side took depositions which reveal a few facts about their property. 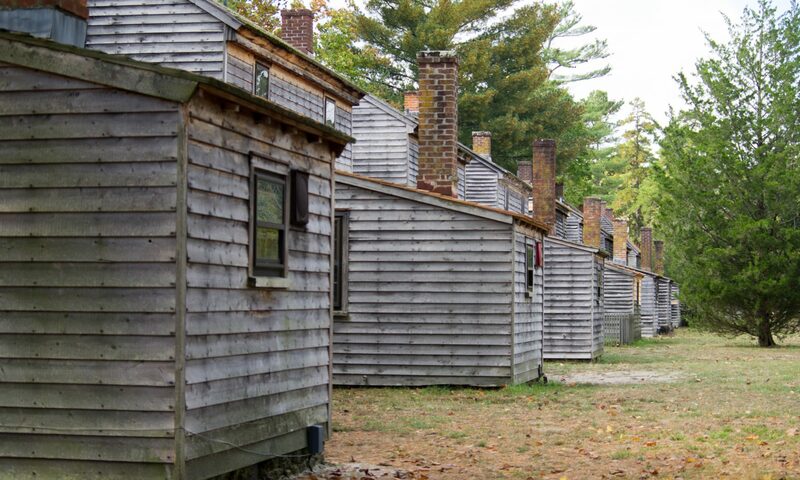 The Pleasant Mills property consisted of 380 acres and included the Pleasant Mills and Batsto Forge Pond. 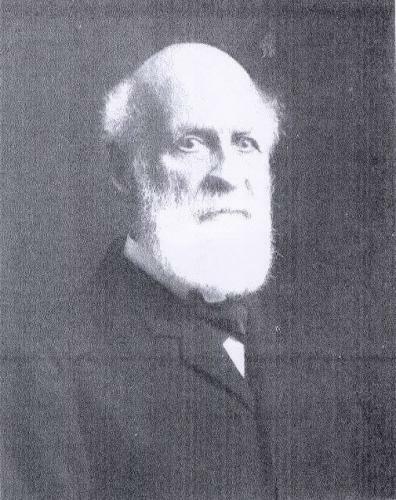 William Farrell owned 2/3 of the property with the final one third owned by Amos L. Hollingsworth of Boston, Zachary J, Hollingsworth, Mark H. Hollingsworth, and Jennie H. Warren. Farrell’s deposition claims that the dam Richards built was 7 feet high and was built with the express intent to stop the flow of water down the Nescochague which at that time amounted to a $2500 loss to the paper mill. That the deponent has not entered the Mill at Pleasant Mills for many years and that he remembers when he last saw the machinery there, that there were not so many as six engines (as John W. Farrell swears there now are) in the mill at that time, that the number of engines has been increased by said complainant or some of them during the last few years, that every engine require a large increase of the power at the mill to run it with the other engines, and a large increase in the consumption of water at the mill in moving said additional engine and its connecting machinery, that said engines are large tubs or vats filled with pulp mixed with water, which is ground in the engines into a fine soft substance by wheels revolving in the same at great velocity, each engine using and consuming a large quantity of water itself to soften the pulp with while grinding it. That deponent has been informed and can prove, that a new and larger and heavier water wheel has been put in at said mill within a few years by the complainants, to move their machinery there, and that they have from time to time added to and increased the size and number of their other machinery in said mill used for various other parts of the process of making paper. That the increase in the number of engines, and the increase in the size and weight of the new water wheels, and the increase in the various other machinery has greatly increased the demand of said mill upon its water power, and the complainants need more water to run their present machinery than they needed to run their old works a few years ago. That deponent has had no means of examining into this part of the case, because the said mill is closely shut up, and a sign with the words “No Admittance” is fastened up outside of it, and no person is allowed to enter there. In 1875 or early in 1876 my brother Augustus Richards made an application to you for a right of way for a ditch to carry water from the Forge Stream to his cranberry bog. Your agent Elisa Wright had charge of the matter and my brother had a number of letters from him on the subject of the ditch and a draft for a conveyance made by said Wright from you to him. The matter was finally so far carried out that said Wright drew a deed in fee from you, and your wife, to my brother; for a strip of land forty feet wide and extending from a line of your property to the middle of the Forge Stream. This deed was delivered and after so long an investigation of it’s object and having been drawn by your surveyor, it was supposed by my brother to be sufficient to vest the legal title to him and the land agreed to be conveyed by you including the ditch then opened. I regret to inform you however that in a suit in Chancery in the state of which my brother is defendant, Elisa Wright testified as a witness that my brother is not the owner of the land he supposed was vested in him by the deed aforesaid, and said Wright has made a map showing the lines of the property to be at one side of the ditch. It seems that a mistake was made in (some) course or line, which has changed the lines of the (property) you conveyed. Mr. Samuel H. Gray as council in this suit is taking advantage of this mistake, and Mr. Wright is proving it as a witness for the purpose of obtaining an injunction against the use of the water for irrigation, and the matter was urged before the Chancellor at Trenton only yesterday strenuously as a ??? against the defendant my brother. As the object and purpose of the conveyance in a ditch was well known to all the parties, before and at the time of the execution and the delivery of the deed by you, there is no doubt that the failure to convey the land including the ditch is a mistake, and I have no doubt that you correct it. It is important that this should be done promptly. I now address you so that you may know the position Mr. Grey and Mr. Wright occupy in the case against my brother, and as I hear they are your advisors, or have been, to respectively request that you will take no steps at their insistence which will interfere with the proper adjustments of the lines ?? the ????? as my brother. I should like to hear from you on the subject as soon as possible and I beg leave to suggest that you will not confer on the subject of this letter with either Mr. Gray or Mr. Wright who are too far engaged for Mr. Farrell to be well able to aid my brother in correcting the (error). If Howard Richards thought the mistake was made on purpose, he did not let that known. Wharton on the other hand apparently still wanted Augustus Richards to have his easement, and someone wasted no time in correcting the matter. Just 12 days after Howard Richards wrote Wharton, two deeds were drawn up with Richards giving Wharton back the 40 foot wide property that was mistakenly given him, and Wharton giving him the the land 20 feet on each side of the canal. As you can read below the new March 28, 1878 deed from Wharton to Richards left no doubt that if it had been drawn up by Wharton himself he did not pull a fast one with the original deed. And it is the intention of this conveyance to give and secure to the said Augustus H. Richards and his heirs and assigns the benefit of the ditch already opened by him and conveying the water from the said stream into his lands and also the Ripple Dam constructed by him in the bed of the stream to assist the flow of the water into the said ditch. Excepting and reserving to him the said Joseph Wharton his heirs and assigns forever the right to cross the said strip of land with a wagon way, without any other cost to him than that of building and repairing the same. In the end it appears it was all futile. During February 1879 the court made the decision for an injunction to end the diversion of the water by Richards. If he ever abided by it, or appealed the decision is unknown by me. 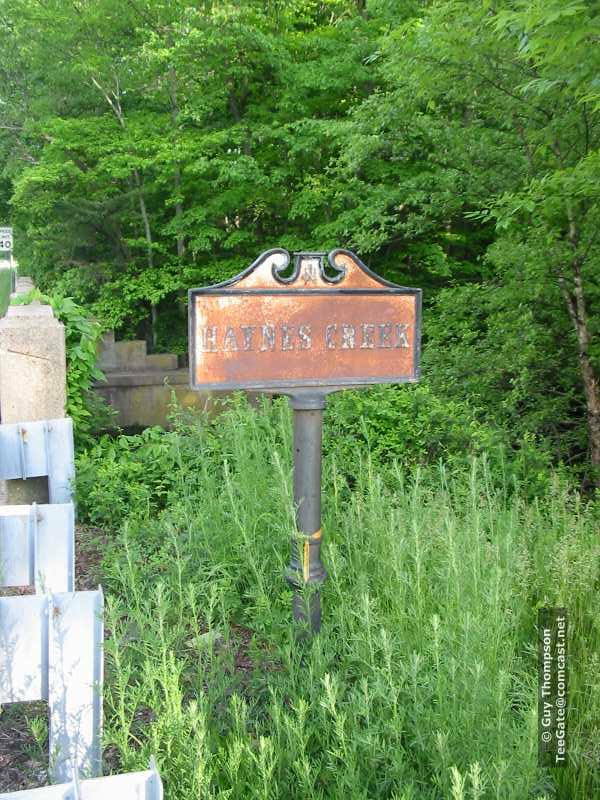 However, according to John Pearce in “Heart of the Pines,” the paper mill run by Farrell burned in 1878 which would put that incident during the time of this court case, and before the court made the decision to side with Farrell. The paper factory did resumed in 1880 apparently after it was rebuilt. It is interesting to note a few things. As late as 1957 in aerial photos of the area, it can be clearly viewed that there was recent dredging of the canal from it’s beginnings on the property mentioned in this article, all the way down to the land near Ace Campground. It also appears the canal was in use. This would mean that the owners of the land that Richards once owned still owned the easement for the canal and were using it or trying to. But when Joseph Truncer and the rest of the Wharton survey team carried out the massive survey of the Wharton property in 1954 to 1957, they only considered the easement first given to Richards by Wharton as an “Exception” that Wharton did not own. And as you have read that was not the property the canal was on, so the state considered the canal to be owned by them. 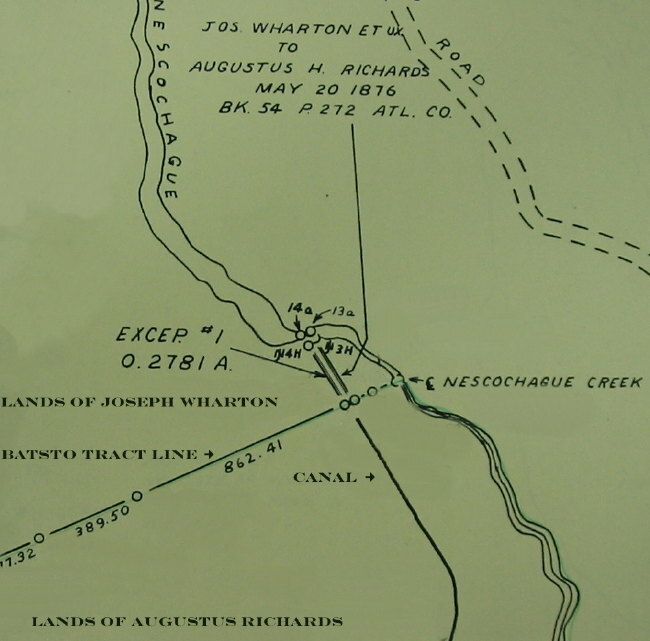 If indeed the new deeds made up by Richards and Wharton were actually carried out, the state would have known to survey the actual canal location. The records show that they surveyed only the original location meaning the canal was owned by the state. The property owner who owned the rest of the canal would not have access to the river and legally could not use the canal. The area known as Rockwood lies on the east side of Route 206 in Hammonton just north of the Paradise Lake Campgrounds, down the long straight road officially known as Rockwood Road. Just like the Paradise Lake property, Joseph Wharton owned much of Rockwood in the 1880s. In fact Paradise Lake and Rockwood once were part of the larger West Mills tract. Wharton separated the two parcels when he sold most of the property that would become known as Rockwood. J.G.Wilson, historian and long time editor of the Hammonton News, writes about this sale in the Fall and Winter, 1981 edition of The Batsto Citizens Gazette, but unfortunately he incorrectly identified the man named Rockwood in his research. He names a George Rockwood of Newark as the purchaser of this property from Wharton. 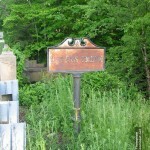 enry Charlton Beck traveled through the Rockwood area many years before Mr. Wilson wrote the article, and even at that early date the workers at the bogs did not know about Rockwood when Beck asked them about him. Their only clue was a stone boundary marker they had viewed with a date and the initials C.G.R. incised into it. 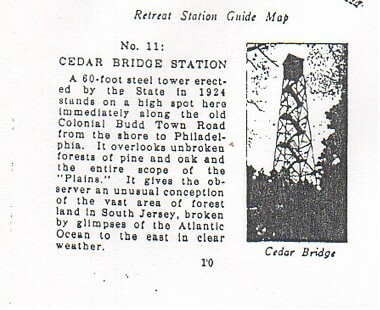 Beck mentions this in his book More Forgotten Towns of Southern New Jersey. This author has never uncovered anything written about Rockwood except that information noted above, but that is about to change. The following paragraphs attempt to clear the mystery surrounding Charles Greene Rockwood Jr., one of the most unknown men in NJ Pine Barren history. This story must begin with the subject’s father, Charles Greene Rockwood Sr., who may have played some role in the Rockwood venture, but no confirmation has been found yet. Charles Sr. was born in 1814, the son of Ebenezer Rockwood and Elizabeth Breeze Hazard, and the grandson of Dr. Ebenezer Rockwood. Dr. Rockwood served as a surgeon’s mate at Dorchester Heights near Boston in 1776, and as a surgeon in the years following. His ancestry can be traced back to Richard Rockwood, a planter from Dorchester England in 1636. Charles G. Rockwood Sr. would become a banker serving as the Cashier at the National Newark and Essex Banking Company in Newark New Jersey, apparently working his way upward in stature there in the following years. 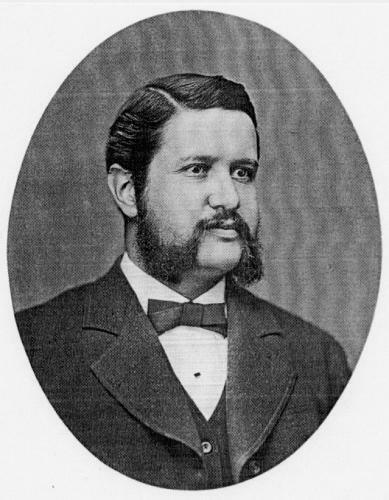 On January 13, 1887 after the death of the president four days earlier, Rockwood Sr. accepted the presidency of the bank. In 1904 Mr. Rockwood completed compiling a book for the 100th anniversary of the bank that year titled One Hundred Years : a Record of the Oldest Bank in the State of New Jersey, but died before completion of the book’s publication. His work on the book, and the fact he did not survive to see the final outcome of his work is mentioned within its pages. He married Sarah Smith (1812-1893) whose grandfather, Ebenezer Hazard, graduated from Princeton and, in 1775, served as Postmaster under the Committee of Safety, and in 1782 became Postmaster General. Both Rockwood and his wife’s family possessed very historical and strong ties to the American Revolution, but the subject of this monograph became their one surviving male offspring, although the couple had several children. Their son William died at age 1 and daughter Elizabeth just before her fifth birthday, leaving Johanna and Charles Jr. their only known surviving children. Charles Greene Rockwood Jr. was born January 11, 1843 in NYC and graduated Yale University in 1864. After graduation he continued his studies in higher Mathematics and Modern Languages, and received his Ph.D. in 1866. Later, as class historian, he would publish a book titled History of the class of 1864, Yale College, and the Supplement to the History of the Class of 1864, Yale College. Besides being a Mathematician he also graduated as an Astronomer, with interests in Seismology, Vulcanology, and Solar Heat to name just a few. He served as a Professor of Mathematics at Bowdoin College in Maine (1868-1873), at Rutgers (1874-1877), and eventually at Princeton (1877-1905) where he spent 28 years teaching and resided a block away from the university at 34 Bayard Avenue in downtown Princeton. 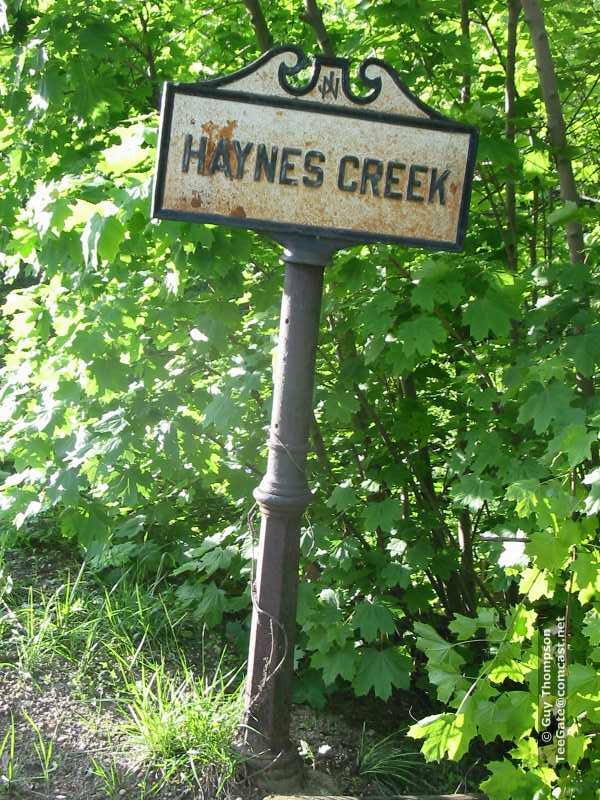 Ironically, Bayard Avenue today is Route 206 in Princeton, so he lived on the same road as his cranberry venture near Hammonton. Rockwood held a membership in the American Metrological Society and served as their first secretary. He wrote numerous articles and monographs that appeared in the American Journal of Science concerning his studies on America earthquakes. He also penned annual summaries of progress in Vulcanology for the Smithsonian Institution. He became a member of the National Geographic Society, the U.S. Geological Society, and the New Jersey Historical Society. Because of his knowledge and interest in the various fields mentioned above, the Director of the U.S. Geological Society asked him to take part in the preliminary report on the August 31, 1866 earthquake in Charleston, South Carolina that killed more than 50 people. After he joined the faculty at Princeton, he participated in Princeton’s expedition to view the Solar Eclipse in Denver, Colorado, and study submarine temperatures in the Gulf Stream. On June 13, 1867, at New Haven, Connecticut he married Hettie Hosford Smith and had a daughter Katharine (Katie) Chauncey Rockwood who was born on 2/2/1872 in Hudson New York. Hettie’s family, like Rockwood’s, had a rich history dating back to the Revolutionary War and before. She was the daughter of Simeon Parsons Smith and Hettie Hosford Smith, the granddaughter of the Rev. Davis Smith and Catherine Goodrich, and the great granddaughter of Ebenezer Smith (1746-1816) and Sarah Dean. Ebenezer Smith served as a minute man in 1775 and as an ensign in 1776. He served at Ticonderoga, Bunker Hill, the seige at Boston, the capture of the British army officer John Burgoyne, Sullivan’s campaign in Rhode Island, and the Battle of Monmouth. To help raise Katharine and do the work around the house, Rockwood employed a widowed older black servant from New Jersey (mistakenly overwritten on census schedule with the word “Ireland”) named Catherine Farmer according to the 1880 census. He was not alone in this since his father and many of his neighbors also did the same. Frequent travels to Europe must have been easier with her around. ockwood was a religious man and attended the First Presbyterian Church in Princeton New Jersey, where the congregants ordained him as a Deacon on April 25, 1880, and an Elder on May 23, 1897, a position he held until his death. In 1905 Rockwood resigned from Princeton; however, his title just changed to Professor Emeritus of Mathematics, retaining his ties to the institution. At some time after retiring, he and his family moved into the Princeton Inn and he apparently sold his home. With his wealth the luxury of this address may have suited him well. Letters from Rockwood suggest that sometime between this point in time and the end of his life, he resided in Newark as historian J. G. Wilson claimed he did. By circa 1910, Rockwood’s health began deteriorating from what his doctor determined to be General Sclerosis. During the summer months the Rockwood family lived at the luxurious Monomonock Inn in Caldwell New Jersey, and it was there on July 2, 1913 at 3:00 a.m. that Rockwood’s life ended from this disease. His obituaries and various funeral reports in the Princeton Press in the days following his demise gave testament to a well liked and respected individual. The family held his funeral in Caldwell New Jersey the day after Independence Day, with internment in the family plot located just a few feet off the main road through the center of the Rosedale Cemetery in Orange. After her father’s death, documents show Katharine substituted and completed some of his responsibilities in his various ventures. She would occasionally have contact with Princeton University concerning her father’s tenure there, but very little has been learned about her in the years following her father’s death. On November 29, 1925 her mother Hettie passed away, and 43 days later Katharine sold the property at Rockwood to Franklin E. and Frank Earl Haines. By 1931 she still dispatched correspondences from the Princeton Inn with her initials on the stationary, but by October 1933 she resided in Durham Center, Connecticut on Sunset Hill across the street from the Goodrich house, which had been the home of her grandmother, Catherine Goodrich, daughter of Ebenezer Smith. It seems apparent that historical ties to her mother’s family remained strong, since her middle name of Chauncey is obviously taken from her famous relative Chauncey Goodrich, the lawyer and politician from Connecticut. 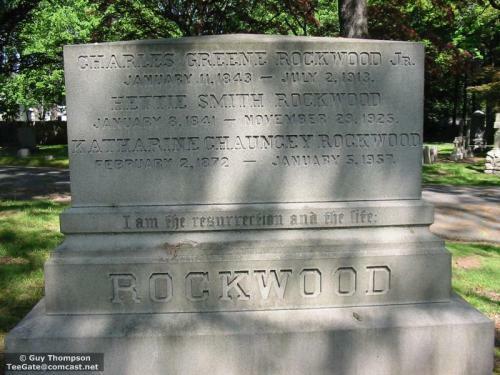 She died in 1957, retaining the last name of Rockwood to the end, apparently never marrying. Relatives, presumably from her mother’s family, interred her remains in the family plot with her parents. Since she was the only child, the Rockwood family name ended with her. How Joseph Wharton came in contact with Rockwood is currently unknown, but one could speculate that as a banker the elder Rockwood surely could have had financial contacts with the Quaker land baron. It seems obvious that Wharton, while buying much of the land in that area, sold many parcels to what may have been friends and business partners. 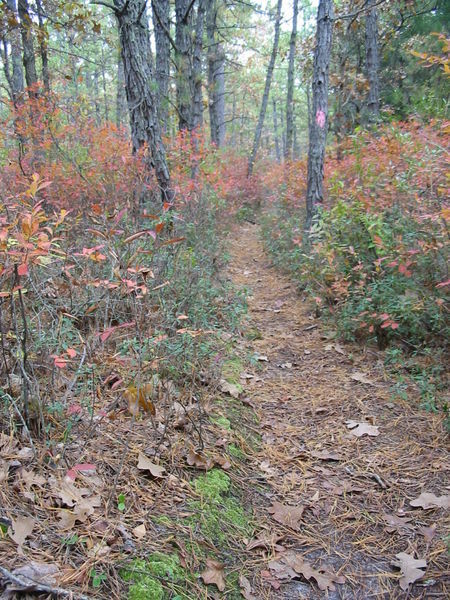 One example of that is the portion of the West Mill tract we know as Paradise Lake Campground, which Andrew Rider, the founder of Rider College, purchased from Wharton in 1898, and various cranberry companies purchased many of the parcels along what is now Route 206 from Wharton, in many instances just a year after Wharton had acquired them from their previous owners, some of them being cranberry companies. On February 9, 1887 Charles G. Rockwood purchased what appears to be over 500 acres from Joseph Wharton, all of it on the east side of 206 just north of what is now Paradise Lake. 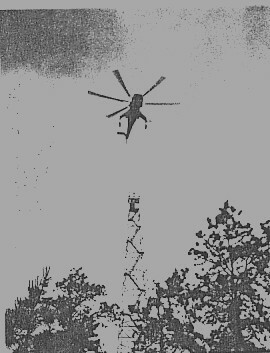 Most likely when Rockwood purchased it, lessees already operated the cranberry bogs there along with a possible blueberry operation.